The tale picks up eight months after the final scenes from book one and Sarai is attempting a normal life. The problem; she is not normal. Sarai sets out to even the score and despite all her planning things go seriously wrong. She ends up back with Victor and ooh-la-la these two are on fire together. It is like looking at the sun. Of course, these two cannot just ride off into the sunset and the tale Redmerski takes us on will test them all. The tale shares both Sarai and Victor’s perspectives. Although more chapters are devoted to Sarai, we get inside both of their heads We get to know Victor more and see the incredible impact Sarai has had on him. Sarai is stronger, colder, and more determined than ever to lead the life she wants. These two and the circle they travel in are dark. At times, this is violent, and gritty. Other characters are present such as Victors partner, Fredrik Gustavsson. The man is smexy and unsettling. Victor’s brother while absent most of the tale plays a large roll towards the end. Redmerski holds nothing back as the plots twists and turns. There is drama, secrets and confessions. It was riveting, and I quickly consumed this. I listened to the audio version of Reviving Izabel and Kate Reinders nails the voice of Sarai. She brought Sarai’s thoughts and stone cold attitude to life. She even did an excellent job for Victor. Now comes the not so good part; Stephen Bel Davies did the voice for Victor, and it failed for me on some many levels. I know Victor is cold, has learned to suppress his emotions but the monotone delivery brought none of the Victor I experienced while reading. His voice for Sarai and other characters offered no real distinction. Sadly I am unsure if my rating might have been higher if I had read this or Reinders did the reading solo. The series has won a place for Redmerski among my favorite authors list, and I cannot wait for the release of The Swan & the Jackal, which will share Fredrik Gustavsson story. It is currently availabe in kindle/paper editions but will release on audio June 6th. Narrated By Luke Daniels, Andi Arndt, and Kate Reinders. Fans of dark, intense, action-packed suspense wrapped up with a romance and fleshed out characters need to read this series, STAT. EEEEE, I need to read the first book. But I love the idea of this series. JA is an amazing writer too. Bonus! EEEE is right these are awesome! I completed the series in e-books last week, there was a day when it was on sale. Hope I’ll be reading them soon – and maybe I’m shallow, but I like seeing my name on the cover of a book lol ! I really enjoyed Killing Sarai so I’m pleased to see you enjoyed this one Kimba, I was thinking of getting it on audio but the monotone of the male reader would put me off so I might stick the reading it. A great review! I hope you are feeling much better. I have the first book and the third of this series but have not read it yet. LOL, I don’t know why but the third book was on sale but the second wasn’t. I’m glad you loved it though, I really can’t wait to get started on this series! Everybody I know loves it so far! I still need to read this. I loved Killing Sarai and I’m glad this one was at least almost as good. I’m reading this series, not listening to it, so I’m glad I won’t have to worry about the narration. I’ve found that dual narration only really works for me when a book is told from 1 point of view. When there are two points of view then each narrator has a different voice for the characters and that really messes with the effect for me. Great review Kimba! Oh my Gawd, I can’t wait to read this! I’d expect the second novel in a series to suffer a bit from the second book in the series syndrome, but it sounds like it’s a great with syndrome and all, so I’m all the more excited to read it! Yey! I’m really intrigued by this series! I haven’t read from this author yet (well I did try, but I put it off), so maybe I should start with this series. I’m sorry the male narrator didn’t work for you though. Weeee I plan to read this VERY soon! Even if you didn’t like it as much as the first one it sounds really good. I should try more of her… It’s just that I loved the edge of never and was really disappointed in the sequel so now I’m anxious about her other books. Ooh J.A. Redmerski! I didn’t know about this series but it sounds like something I would def like. And I heard great things about this author’s other books. Too bad the narrator for Victor was so bad. Monotone voice acting is the worst! But at least the other one nailed it. Great review, hun! i actually havent listed to an audio book before..i find it so weird. I don’t think i would be able to properly get into the story or invested at all. i’m more of a ‘sit down and read it’ girl, nevertheless i’m sorry the first book was way better in your opinion for you but at least this one doesn’t sound like it suffered from second book syndrome or anything! Great review! i’ll have to add this series to my TBR! This does sound good. I would definitely like to get the first book. Great review! I would totally get the third book on audio because I adore Luke Daniels have you listened to him before? He does the Iron Druid Chronicles and he is outstanding. I have it pre-ordered Heidi! Dark and action packed with a cover like that, how can you go wrong? I love Jessica’s writing, so I am definitely checking this out!! Fantastic review!! Intrigued by the cover. I’m such a cover person. Sounds like another good series! I haven’t read any of her books but I remember the good reviews for the first book in this series. I’m pretty curious about it now and might have to pick it up. It’s too bad one of the narrators wasn’t so good but at least it wasn’t the whole book and only a portion. The voices really can ruin it pretty easily. I really really love this series! I wonder what your opinion will be on Fredrik’s story. It has a major plot twist, like what?!. I definitely agree that Victor and Sarai are on FIRE! So right, so right! What a shame Kimba 🙁 this could have been easily a 4.5 or a 5 for me, but what a terrible casting they did for Victor. That I listened to th entire book despite Victor’s interpretation is proof of how much I enjoy the plot. Anxiously waiting for the next book. I like Redmerski’s writing, but have never been sure if this series is a good fit for me. A lot of my friends love it, though. 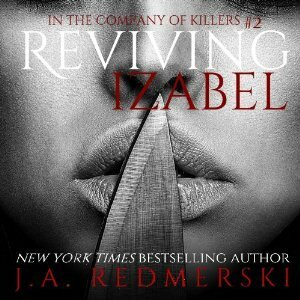 I’m glad you enjoyed Reviving Izabel, Kimberly! Okay, so I haven’t read the first in this series but it’s on my list and, even though this one isn’t *quite* as fab as the first one, it sounds like a good addition to the series as a whole. Ummmm I need this series in my hands today Kim! I’ve heard nothing but amazing things about Killing Sarai, and while you didn’t feel this one was quite as strong, it still sounds amazing overall. Can’t wait to read! I’m definitely intrigued by this series though this one doesn’t grab me as much as the first one did. I’ll definitely have to give the first one a try! For some reason I have been so hesitant to pick this series up and I guess I shouldn’t be, it sounds like it is a good one. I’m glad to hear you enjoyed this one, Kim. I struggled with Sarai a little bit in this one, so I didn’t enjoy it as much. She tried to act badass but then she would do something really stupid that would make me question what the heck she was trying to do! I also felt like Victor’s transformation was a bit too much. I suppose I wanted something a little slower. Still, I loved the first book and J.A Redmerski is a great author! Lovely review, Kim. Love the cover! I really want to read the first book in this series soon.